Does anyone here own the "Go Where You Wanna Go" 45 (Dunhill 4018)? Discussion in 'Music Corner' started by johnsmusicbox, Jul 26, 2009. Or maybe know of someone who owns an actual copy, with or w/out picture sleeve? I've heard of only one copy, that someone I talked to actually owned, but sold some time back. Anyone have any idea how many were made, or how many still exist? 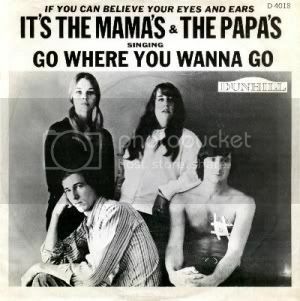 One of John Phillips' earliest Mamas & Papas-era songs, the title phrase was inspired by words that his mother told him while he was growing up and searching for identity. Phillips crosses this with an illustration of heartbreak he felt when he was separated briefly from Michelle Phillips (see "Look Through My Window"). Musically, it's a breezy and buoyant slice of folk/ pop with some subtle country & western flourishes. The song was chosen by producer/label owner Lou Adler as the group's pilot single, although it never made it beyond a Hawaiian release as a 45. They would certainly do better soon with "California Dreamin'." Still, this is one of the group's most definitive recordings. Since “Go Where You Wanna Go” and “California Dreamin’” had the same B-side, “Somebody Groovy,” and their catalog numbers are separated by a mere 2 digits, Dunhill 4018 and Dunhill 4020, it is obvious that the second single quickly superseded the first, indicating some sort of anomaly…likely a lack of commitment, enthusiasm and planning. “California Dreamin’” was reviewed in the December 25, 1965 Billboard (and was given a full page ad in the December 18th issue). I scanned the issues of that magazine back to October 30, 1965 without finding an ad or a review of “Go Where You Wanna Go.” This suggests that the single was never a national single, which agrees with the emphasized line in the AMG review. "The question of 'Go Where You Wanna Go' being the first single... that must be the period of time when we were in between doing Barry McGuire's version of 'California Dreamin'' and having finished 'Go Where You Wanna Go.' It's a gray area for me now, but we put out 'Go Where You Wanna Go,' and I had it out maybe a week or so when we shipped it when we finished 'California Dreamin'.' I just thought that it was a better first record. And we just stopped the presses on that, and released 'California Dreamin'.' It was not really 'test marketed' in Hawaii, which is what some people think, although we may have gotten out first responses from there. We didn't send it out to test it in order to put it out." And featured the same musicians playing almost the exact same chart. A sweet single for the 5th D.
Yes I did own it [*the picture sleeve] and the 45 but sold them both for $500. They are super rare. I probably should have kept it. The only scan I have is attached. I should have done I high resolution scan. If I remember right theres only 1-2 others I ever heard of existing today. I have a Stateside Demo (1968) . It starts with Mama Cass talking about the Beatles and then drifts into Go where... Dunno if its rare or valubale but as its the best they ever did, it ill never be for sale.